A breakthrough in the early detection of returning skin cancer has been identified via a simple blood test, scientists have said. According to new research, the tumour DNA test detects cells that are linked to the likely return of the disease. In seven out of 10 cases involving malignant melanoma - the deadliest form of skin cancer - faulty versions of the BRAF and NRAS genes are found to be present. Research indicates that the detection of either of these cells means doctors will be able to predict whether the disease will return within 12 months. Leader of the research, Professor Richard Marais, director of the Cancer Research UK Manchester Institute, says: "For some patients with advanced melanoma, their cancer will eventually return. "We have no accurate tests to predict who these patients will be, so our findings are really encouraging." The professor says being able to accurately predict if cancer is going to return will enable medical professionals to determine who will benefit from new immunotherapies, which reduce the risk of cancer spreading. "The next step is to run a trial where patients have regular blood tests after their initial treatment has finished in order to test this approach," he added. 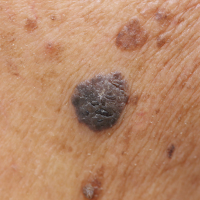 Around 15,400 people in Britain are diagnosed with malignant melanoma each year. Although survival rates have doubled in the last four decades, every year around 2,500 UK adults do not survive the condition. Survival rates for those identified as having BRAF and NRAS cells are around 35%, compared with 65% among those who do not have the genes. Professor Karen Vousden, chief scientist at Cancer Research UK, says an early warning system that can predict if a cancer will return could transform patients' lives. She added: "Research like this shows that for some cancers, there may be ingenious solutions - such as a blood test." People with cancer can get peace of mind when enjoying holidays and overseas travel with our specialist cancer travel insurance.